Gianduja is a Swiss chocolate - either milk chocolate or bittersweet - flavored with hazelnut. It's expensive and available on the web. For the holidays you can go all out - or simply subsitute Nutella. The Puff Pastries (Pâte à Choux) are a simple type of pastry that can be easily transformed in many, sometime spectacular, preparations. 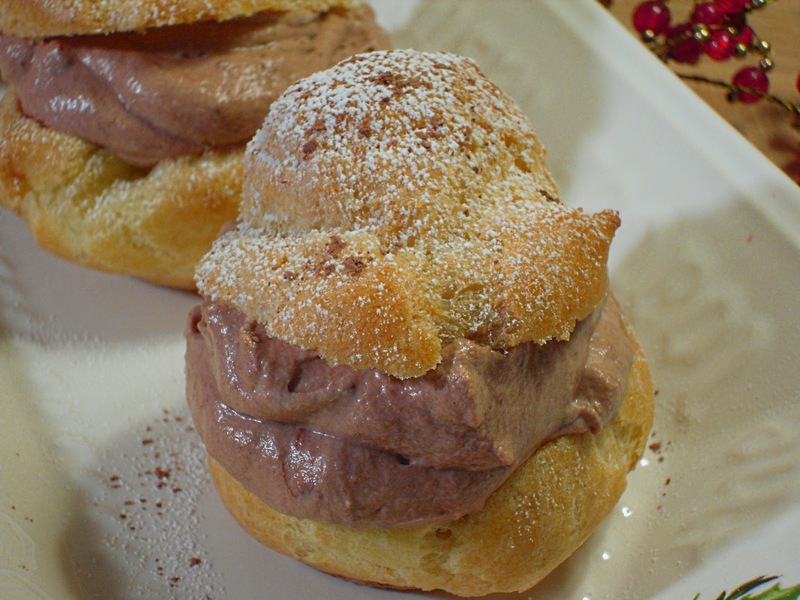 Sounds fancy, but once you learn to make pate a choux — with butter, sugar, salt, flour and eggs — you can make a ton of savory and sweet delicacies, including gougeres, profiteroles, cream puffs and eclairs. Grease a large baking sheet; set aside. In a medium saucepan combine water, butter, and salt. Bring to a boil. Add flour all at once, stirring vigorously. Cook and stir until mixture forms a ball that doesn't separate. You can see how the dough pulls away from the pot and leaves a thin film. Add eggs, one at a time, beating well with a wooden spoon after each addition until well incorporated. Pipe dough with a decorating bag or drop 12 mounds of dough onto the prepared baking sheet. 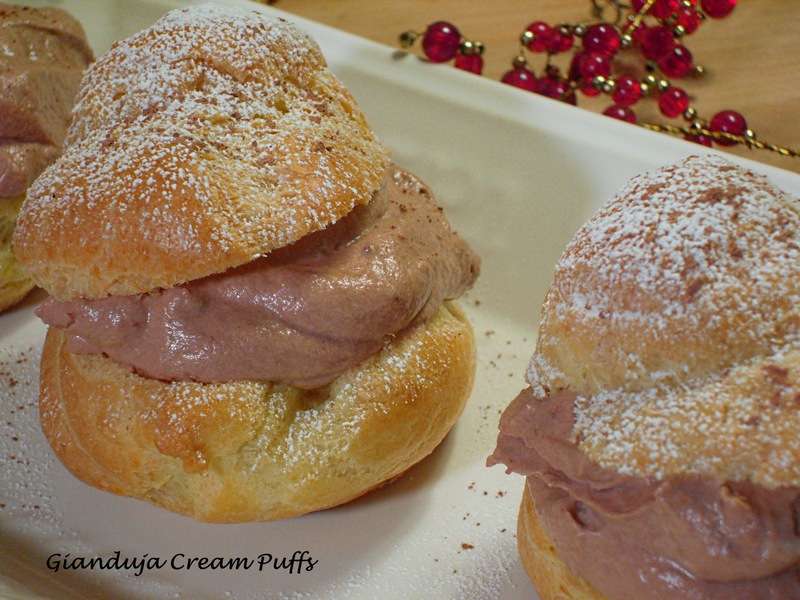 Smooth out any rough peaks in the tops of the cream puffs. Bake for 30 to 35 minutes or until golden brown and firm; cool in the oven with the door ajar. When cool, cut tops from cream puffs and remove soft dough inside. In a large bowl, beat whipping cream with an electric mixer on medium until soft peaks form. 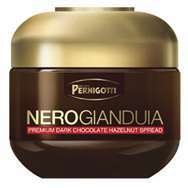 Beat in chocolate hazelnut spread. Before serving pipe or spoon filling into cream puffs. Replace tops. Sprinkle with powdered sugar and cocoa powder.